Accepta 7120 are high performance, eco-friendly oil absorbent pillows scientifically formulated and developed for use in oil separators, oil interceptors and for pollution control and oil clean-up operations. Accepta 7120 are innovative oil absorbent pillows developed specifically to help control pollution arising from oily water discharges from oil separators, oil interceptors and drainage culverts. Accepta 7120 preferentially absorbs oils and greases, helping to accelerate the breakdown of absorbed hydrocarbons by bacterial action. The pillows are designed for the continuous absorption of oily waste but may also be used to assist in spill clean up operations absorbing excess oils and grease from accidental spillages. Combining a blend of hydrocarbon degrading bacteria and oleophilic fibre, Accepta 7120 degrades the blooms of hydrocarbon-based materials commonly found in interceptors and similar oily water catchment systems. 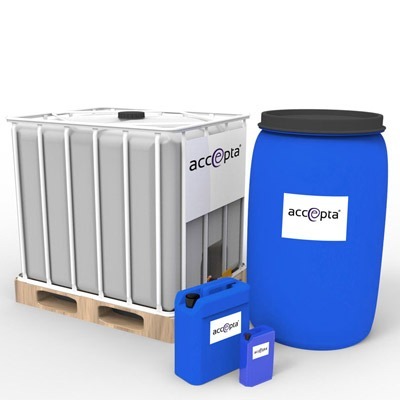 Accepta’s bioremediation pillow units are specially treated to give oleophilic (oil attracting) properties with hydrophobic (water repellent) filament yarn. The choice of pillow fibre and their construction has been optimised to give an exceptionally high void volume of 92%, for maximum absorption. Stitch bonding provides high tensile strength, dimensional stability and prevents breakdown when fully loaded with oily waste. The pillow immediately absorbs any free oils within the surface water and is capable of absorbing up to 14 times its own weight (equivalent to 9 litres). 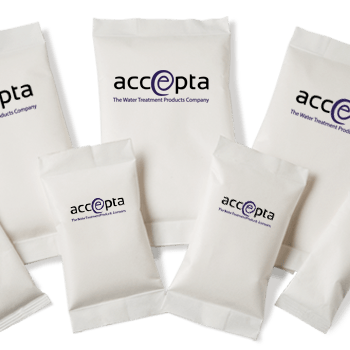 Over a 4 month period Accepta estimate that each standard size pillow has a potential to change in excess of 18 Kg of oily waste into carbon dioxide and water. After use each pillow can be disposed of as dry waste since hydrocarbon is reduced to carbon dioxide and water.